A number of top pundits are predicting that messaging apps will become ‘the new social media’ in 2015, and here’s some evidence to support that theory from Line, the chat app from Japan with over 500 million registered users and 170 million monthly actives. 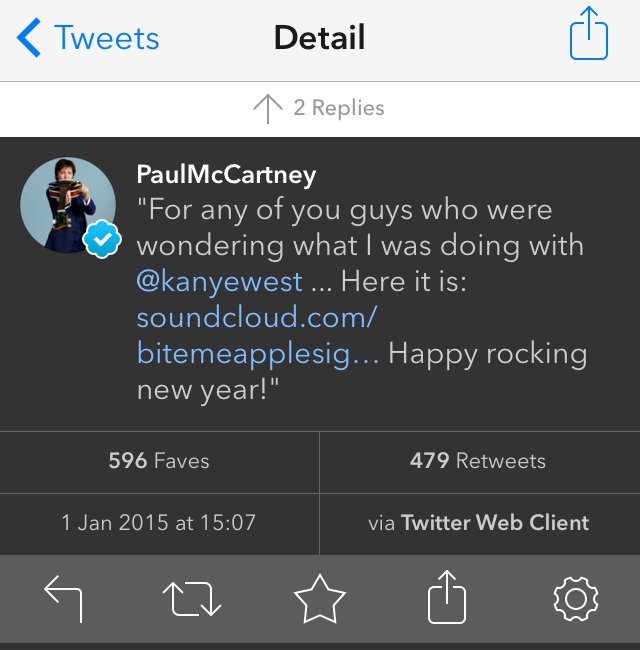 Former Beatle Sir Paul McCartney released a surprise collaboration with Kanye West on New Year’s Eve and I was particularly intrigued to observe how the British musician’s team promoted it online. McCartney is popular on social media and was one of the first global ‘brands’ to jump aboard Line, which has dedicated a large part of its business to connecting companies with users for a fee. His Facebook Page is closing in on 6.2 million likes, he has 2.17 million Twitter followers and (just) 187,000 followers on Instagram. But top billing is reserved for Line — where he has more than 10 million followers thanks to clever marketing and the use of stickers, which were offered free to fans who followed his account. So how did he get on with engagement? Twitter: the @paulmccartney account retweeted Kanye West’s tweet, but only after his team deleted the tweet below promoting the collaboration. It isn’t clear why the tweet was deleted — perhaps it didn’t generate enough interest or McCartney’s team was happier to promote West’s tweet — but the overall engagement numbers are interesting. Instagram comes out top in terms of sheer likes — despite a far smaller fan base. While the Instagram post makes mention that the song is available on McCartney’s website there is no URL so just a small fraction of those ‘likers’ may have actually taken action and listened to the song. Facebook almost certainly got more attention — with traffic to Soundcloud, iTunes and its own video player — but the problem with posting updates to the social network is that Facebook’s own algorithm dictates just how many of McCartney’s fans will have seen it. 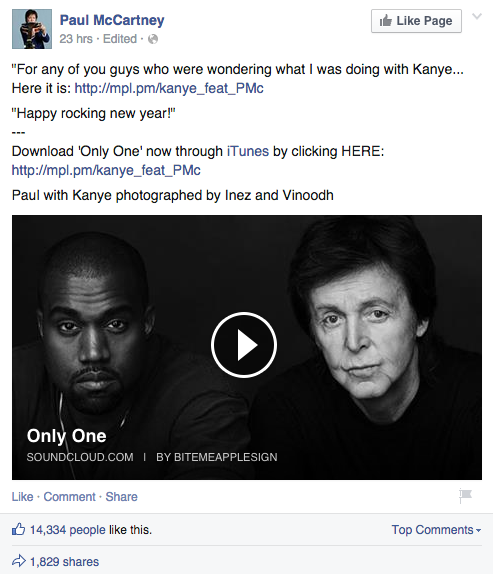 There’s no way that it got served to all 6.2 million fans’ timelines unless McCartney’s team bought Facebook ad space. Line does things differently, and McCartney’s post went out to his fans in two ways — via a public post and private chats. The figures referred to above are from the post that McCartney’s account made to its Timeline, which — as the name suggests — is a Facebook-like chronological feed of public posts available within a dedicated menu inside the Line app. There, users see all updates from their Line friends and ‘official’ (corporate) accounts — like McCartney’s — which they have chosen to follow. Line’s Timeline is governed entirely by each user without an algorithm, they only see items from people they follow and they can also block out accounts they wish to ignore. There is no way a brand can pay to plant their messages there, such as they can do on Facebook, Twitter and (now) Instagram. But, most importantly, McCartney’s account also sent private chat messages to each of its 10 million-plus followers on Line. There is no metric to quantify the engagement of that action, but the fact that most of those fans will have gotten a push notification with the message and link to Soundcloud (just like an SMS) gives you an idea that it might well have been hugely effective. Indeed, on Line, the Timeline post is just a bonus. Line said in 2013 that one-third of its registered users open their Timeline each month, and gauging the total reach of an official account on Line is impossible. Writing for The Next Web back in 2013, I pointed out that chat apps like Line are a genuine threat to Twitter when it comes to advertising cash, and the Japanese company’s December acquisition of Microsoft’s MixRadio service has the potential to supercharge its appeal to artists and musicians worldwide once its proposed music streaming service goes live worldwide. But Line isn’t the only chat app that is rivaling social networks. WeChat is becoming the de factor mobile internet in China — it is a must for any brands seeking to reach consumers there — while the same can be said of Kakao Talk in Korea, which is installed on over 90 percent of the country’s smartphones and also offers accounts for brands. The appeal of chat apps for brands and advertisers won’t just be an Asian phenomenon in 2015, however. Kik, an app that claims to have 40 percent of American’s youth on its service, recently let brands on to its platform, Snapchat is planning an Asia-style platform (and it just raised a truck load of cash). Even also-run Tango linked up with Spotify and offers a timeline-feature, while Rakuten-owned Viber introduced a platform for high-profile users in November. That will almost certainly mean a system just like Line’s, which allows companies to pay for an account which users can subscribe to for updates. A premium tier on Line grants companies support for two-way conversations, thus turning them into customer sales representatives, and Facebook may adopt that too. As for WhatsApp, the chat app Facebook bought for $19 billion, it offers an SMS replacement service rather than a platform and its founders seem to have no plan to change that. Asia’s messaging apps have been around longer, and thus most have more mature business models that generate income by connecting brands with consumers, in addition to other non-marketing revenue streams such as games and stickers. If 2014 was the year that the West wised up to the potential of messaging apps, then 2015 is the year that they’ll get smart and make money from them.